New Delhi, India (14 September) -- Farmers cultivating rice on 12 million hectares of flood-prone areas in India are planting flood-tolerant rice varieties at unprecedented rates, thanks to faster seed multiplication, targeted dissemination, and linking of partners. Dr. Umesh Singh, senior scientist at the International Rice Research Institute (IRRI), said, "Earlier, we only provided and field-tested IRRI rice lines that were tolerant of flooding. Now, we assist government agencies and private seed companies to multiply and distribute seeds to farmers at a faster pace." Field-testing a rice variety normally takes 4?5 years before it is released and another 2?3 years before it reaches farmers. Through targeted dissemination, IRRI is helping state governments identify specific flood-prone areas where seeds of the submergence-tolerant variety can be distributed, without having to wait until it is multiplied and distributed en masse. IRRI, celebrating its 50th year of conducting rice research, has been working with India's national and state governments, nonprofit organizations, farmers' organizations, research institutions, and public and private seed companies to promote Swarna-Sub1, a flood-tolerant version of the widely grown Swarna variety. Even before the seeds are released, different research institutions are already multiplying these seeds," Dr. Singh explained. "Immediately after release, we encourage state governments, as they distribute the seeds to other channels for large-scale multiplication, to also disseminate the seeds directly to farmers in target areas. Farmers need not wait for 2?3 years for mass distribution." Swarna-Sub1 incorporates the SUB1 gene into the Indian mega-variety Swarna, making it resilient to flooding of up to 17 days while retaining the desirable traits of the original variety," said Dr. David Mackill, senior scientist at IRRI who helped identify the SUB1 gene and develop Sub1 varieties. Under submergence, Swarna-Sub1 provides a yield advantage of about one ton per hectare over Swarna," Dr. Mackill added. "Since this is an improved version of an existing variety, scientists only had to test its tolerance of submergence, lessening the time for field-testing by a year." 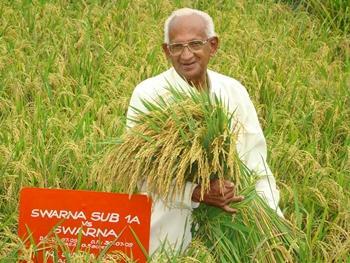 "Swarna-Sub1, released in August 2009, is the first submergence-tolerant, high-yielding rice variety in India," said Dr. Singh. "It was released in record time and is spreading at an unprecedented speed." Swarna took 25 years after its release to be planted on six million hectares, reaching its current "mega" variety status. "We are hoping that Swarna-Sub1 will reach the same status in only five years," Dr. Singh added. "It could entirely replace Swarna and spread to other flood-prone areas all over the country." IRRI identifies flood-prone areas with very low agricultural productivity and where technology diffusion is usually slow. State governments distribute "minikits" or 5-kg packets of seeds to farmers in these areas. To date, 70,000 minikits, or an equivalent of 350 tons of seeds, have been distributed during kharif or monsoon. Within one year of release, this variety has reached more than 100,000 farmers in India.